Preheat the oven to 350°F. Line a 16-3/4 by 12-inch jelly roll pan with parchment paper. Spray with cooking spray. Prepare the chocolate cake as directed on the box. Pour the batter into the prepared jelly roll pan. Bake for 20-25 minutes or until toothpick inserted into the center comes out clean. Lay a sheet of parchment paper down on a clean counter. Invert the sheet cake onto the piece of parchment. Allow the cake to cool. Meanwhile, melt the chocolate over a double broiler until completely melted and smooth. 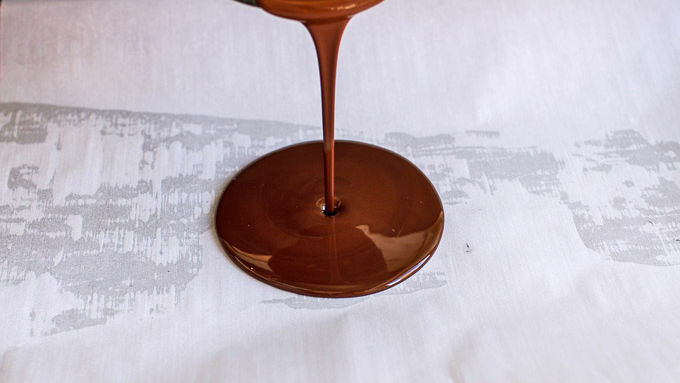 Line a cookie sheet with parchment paper and spread the melted chocolate in a thin layer over the paper. Place the pan in the freezer to harden. Once the chocolate is hard, break the chocolate into shards. Store in the freezer until ready to use. Using a 3-inch round cookie cutter, cut out 12 circles from the cake. Place four of the cake circles on four different serving plates. Frost the top of each circle with chocolate frosting, then top with raspberries. Repeat with the remaining cake layers until you have four (3-layer) cakes. The top layer of cake should be left unfrosted. 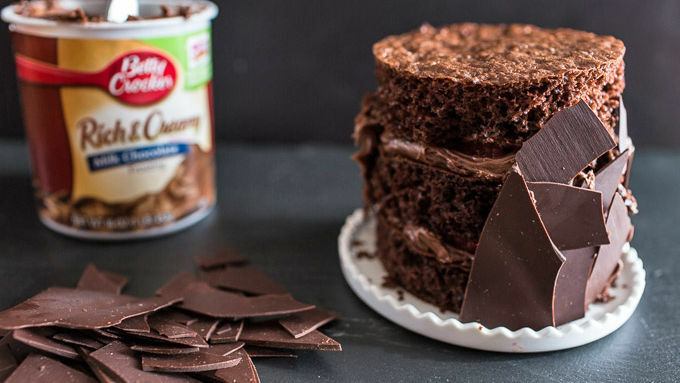 Remove the chocolate shards from the freezer. Smear a small amount of frosting on the back of each shard and place them, one at a time, around the sides of the cakes until the sides are covered. To finish the cakes, top each with raspberry preserves. Cakes can be served immediately or stored in the fridge for up to one day. When ready to serve, dollop each cake with whipped cream and add a fresh raspberry to garnish the top. This recipe can be made into one two-layer cake. 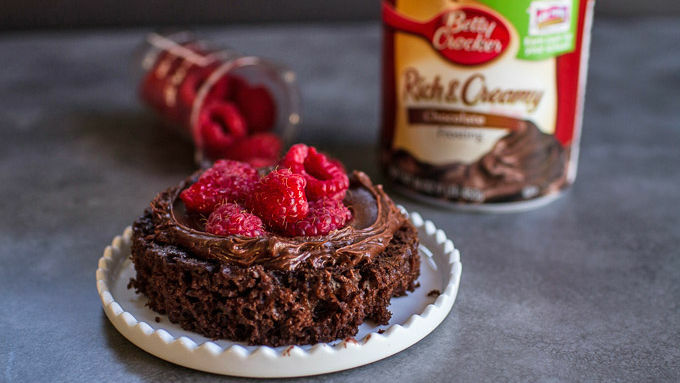 These mini chocolate raspberry cakes are luscious enough for Valentine's Day (or any extra-special occasion) yet easy enough to make yourself! These look absolutely pro! Nobody will know they're easy to make. So I know these cute little mini cakes look a little, well challenging, but I promise – you can make these! And you really should. 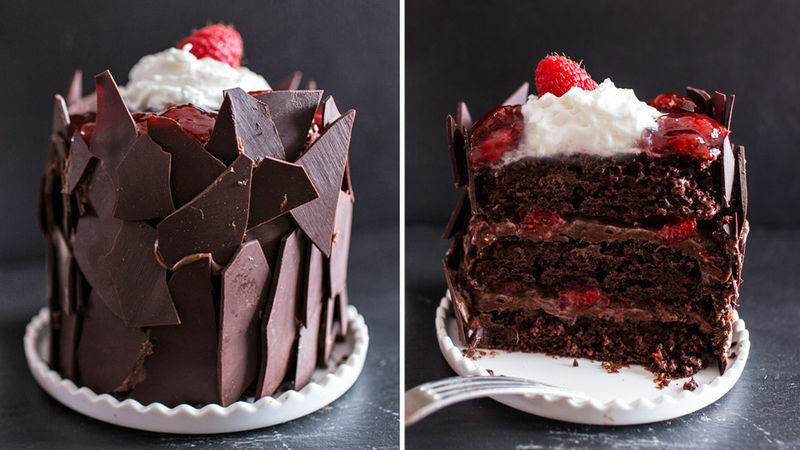 Valentine’s Day is right around the corner and whether you have a sweetheart this year or you're going solo, you NEED these cakes (just a thought here, but chocolate can be a great way to win over that someone special’s heart). We saw these delicious cakes at Oh Sweet Day and thought they'd be just perfect for Valentine's Day. And they are! I mean, chocolate shards, raspberries, chocolate cake (we made our version even easier by using cake mix) and loads of delicious frosting – what’s not to love here? The cakes can be stored in the fridge for up to one day. This recipe can be made into one two-layer cake as well. When ready to serve, dollop each cake with whipped cream and a raspberry. So impressive! So very good!